Astronomers are scratching their heads after discovering a protostellar disk around a young star containing a whopping amount of salts. Orion SrcI is about 1,500 light years away and is currently classified as a young stellar object. It’s a hefty star – fifteen times heavier than our Sun – and is still nestled in a nurturing cocoon of gas and dust. Using the Atacama Large Millimeter/submillimeter Array (ALMA) telescopes, a team of researchers have been able to study its protostellar disk in detail using spectroscopy. To their surprise, they found that Orion SrcI is swamped with salts – as much as one sextillion (1 x 1021) kilograms of it, in fact. That's roughly equivalent to the mass of all of Earth's oceans. “When we look at the information ALMA has provided, we see about 60 different transitions – or unique fingerprints – of molecules like sodium chloride and potassium chloride coming from the disk,” said Brett McGuire, a chemist working on the project at America's National Radio Astronomy Observatory (NRAO), this week. “That is both shocking and exciting." The findings will be published in the Astrophysical Journal (here’s the free arXiv version). The finding marks the first time scientists have spotted salt molecules around such a young star, and they’re not quite sure what to make of it. Normally, salts are found around stars nearing the end of their lives, explained Adam Ginsburg, first author of the paper and a fellow at the NRAO. 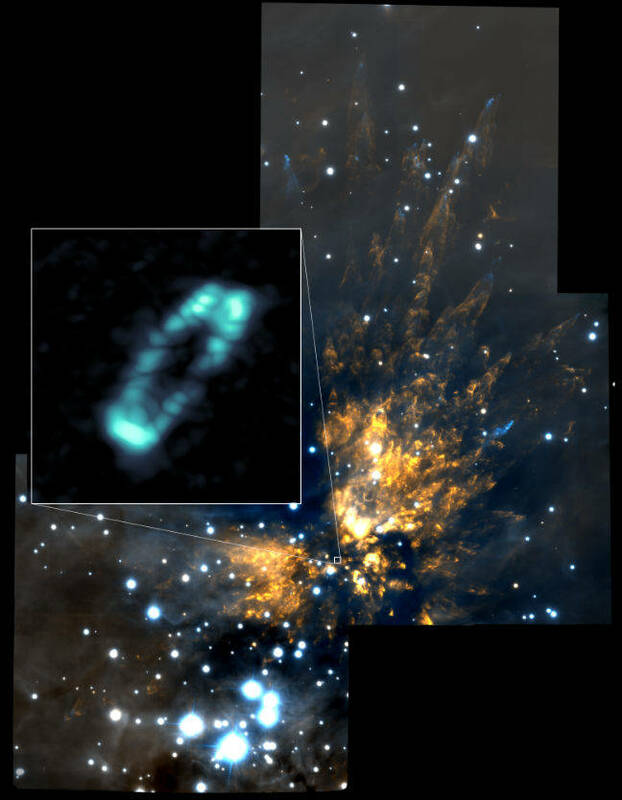 “Since we've only ever seen these compounds in the sloughed-off outer layers of dying stars, we don't fully know what our new discovery means. The nature of the detection, however, shows that the environment around this star is very unusual,” he said. The salt deposits lie in a region stretching from 30 to 60 astronomical units away from Orion ScrI, and are pressed into a disk with wildly fluctuating temperatures. Some parts are blistering cold at about -175 Celsius, whilst other regions are sweltering at 3,700 Celsius (-283 to 6692 degrees in Freedom Units). "Our next step in this research is to look for salts and metallic molecules in other regions. This will help us understand if these chemical fingerprints are a powerful tool to study a wide range of protoplanetary disks, or if this detection is unique to this source," said Ginsburg. One possible explanation for the pile-up of salts could be from Orion SrcI’s violent past. A previous study showed that it was probably ejected from a larger nebula cloud after crashing into another object. The impact sent it flying at about 10 kilometers per second around 500 to 550 years ago. “It is possible that solid grains of salt were vaporized by shock waves as the star and its disk were abruptly accelerated by a close encounter or collision with another star," said John Bally, coauthor of the paper and an astrophysics professor at the University of Colorado.